Like most of you, I love to create anything with yarn. I love to knit anything, anywhere. It doesn’t matter if the patterns are for cowls, scarves, sweaters, dish clothes or blankets. I have even learned to absolutely love knitting socks. Of course, the several pairs I made this past fall for my newborn grandson, Abel, are my favorites. Also, like most of you, my favorite people to knit for are any members of my family. I will truly knit anything for these grandkids! 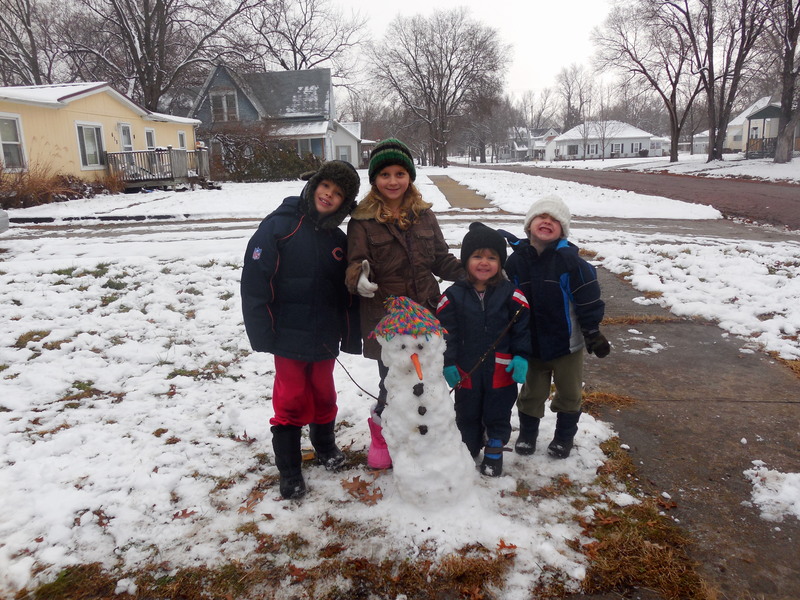 What a smile it brought to this grandma’s face when I saw this adorable photo of four of my grandchildren playing in the snow. As I was admiring how truly beautiful the children are, I noticed that the snowman is wearing one of the hats I knitted years ago. I guess even Frosty needs a grandma’s love! Isn’t it amazing how certain colors remind us of certain things? Walking into Yarns Sold and Told this morning, I immediately saw some brand new yarns, Night and Day, from Euro Yarns. While there are several colors in the yarn display, all I see are the skeins of red/black yarn. Growing up in Pittsfield, Illinois, I grew up cheering for the Saukees (named to honor the Indian tribe once located in the area) at all ballgames always dressed in red and black, our school colors. Even in all musical events, debates, etc, we always wore red and black. In fact, I think everyone in town wore red and black. When we were in Pittsfield recently, my sister and I purchased new Saukees hoodies just because of these memories. So, in honor of the Pittsfield Saukees, I must purchase a skein of this beautiful wool blend yarn! See even my childhood can be remembered in yarn! As a knitter who has just recently began to constantly knit socks, I have gone completely over the top with them. Since there is a limit to how many socks I really need, I knew that my next goal needed to be introducing hand-knitted socks to my girls. Charley loves the pair I gave her for Christmas and Taycee loves the pair I recently gave her. Rebekah tried on a pair and quickly realized that her feet would just get too hot. When Emily was here this week, I had her try on a pair and it was an instant “wow” and I knew she was hooked. That leaves two more daughters, Bethlehem and Katelyn, to jump on board assuring me five out of six daughters would be wearing all these socks. Now to start on my three, soon to be four, granddaughters! Don’t forget that as February is sock month at Yarns Sold and Told, all sock yarn is on sale!!! One of the best parts of working at Yarns Sold and Told is being invited to join the discussion when each yarn representative from each yarn company stops by. Each suitcase is filled with all kinds of new yarns. Each yarn is so beautiful and I, of course, want it all. Today was just such a day! Yarns has chosen and ordered all kinds of fun spring/summer yarns. Yarns is already thinking of different projects to high light these new yarns. Yarns is already thinking of the next few knit-a-longs. With the weather so gorgeous today and with all these spring yarns, it makes me think that spring just might be around the corner.